This isn’t meant as an insult, but you are physiologically lazy. So am I. So are we all. Using treadmill testing, scientists have definitively established that, like other animals, humans naturally aim to use as little energy as possible during most movement. So when we walk or run, our bodies tend to choose a particular cadence, a combination of step length and step frequency, that allows us to move at any given speed with as little physiological effort as possible. How we pick that cadence, though, and whether we can or would even want to change it has been unclear. But a series of recent studies involving runners, walkers, metronomes and virtual reality curtains suggests that while the tug of physiological laziness is strong, it can be controlled, or at least tweaked, with some conscious effort — and perhaps your iPhone playlist. In the first and most revelatory of the studies, physiologists at Simon Fraser University in British Columbia asked adult volunteers to walk on a treadmill at an easy pace. Using motion capture technology, the scientists determined how many steps each person was taking per minute at this speed. A person’s pace depends, of course, on both step length and step frequency. But because the two are inextricably entwined — lengthen your stride and you’ll take fewer steps over a given distance — studying one provides sufficient information about the other, and frequency is easier to enumerate. After establishing each volunteer’s preferred step frequency, the scientists then sped up or slowed the treadmill, and the researchers measured how quickly people’s legs responded. The body, remember, wants things to be easy. When you increase or decrease the speed of your walking or running, various physiological changes occur; the amount of oxygen in your blood rises or falls, for instance, because your muscles start requiring more or less of the stuff. Other biochemical changes also occur within muscle cells. Sensing those changes, the body realizes that, at this new speed, your cadence isn’t ideal; you’re taking too few or too many steps to use the least possible amount of energy. Your body adjusts. But that process takes a little while, at least five seconds or so for the oxygen levels to change and your body to recognize the alteration, says Max Donelan, a professor at Simon Fraser University who was a co-author of the study with his graduate student Mark Snaterse and others. However, the walkers in the study were adjusting their step frequency within less than two seconds after the treadmill speed changed, Dr. Donelan points out. They then fine-tuned their pacing after that. But the first adjustment came almost instantly. The same process occurred when the researchers repeated the experiment with runners. If the treadmill speed changed, the runners’ step frequency shifted almost immediately, too fast for internal physiology to have played much of a role. These intsy adjustments suggest that our brains very likely contain huge libraries of preset paces, Dr. Donelan and his colleagues have concluded, of idealized, “physiologically efficient” step cadences for any given speed and condition. It seems probable, in fact, that over our lifetimes, Dr. Donelan says, our brains develop and store countless templates for most pacing situations. We learn and remember what cadence allows us to use the least energy at that speed, and when we reach that speed, we immediately default to our body’s most efficient pace. Just how the brain recognizes that we are moving at any particular speed is not completely understood, Dr. Donelan says, but almost surely involves messages from the eyes, feet, ears, nervous system, skin and other bodily systems. Interestingly, it seems to be quite difficult to fool your brain. When Dr. Donelan and his colleagues draped shower-curtain-like enclosures around the front of a treadmill, projected a virtual reality scene of a hallway onto it and then manipulated people’s sense of the speed with which they were moving through the hallway, they found that people’s step frequency would quickly change to match this supposed new speed. But then they would settle back into their former cadence, even as the virtual hallway continued to move past them at unnatural speed. Visual cues simply were not strong enough to affect pacing for long. But the scientists have found one signal that does seem effectively to override the body’s strong pull toward its preferred ways of moving: a strongly rhythmic beat. When Dr. Donelan and his colleagues fitted runners or walkers with headphones tuned to a metronome, they found that they could increase or decrease volunteers’ step frequency, even if that frequency was faster or slower than a person’s preferred step pattern. They would also maintain that pace for as long as the metronomic rhythm continued unaltered. The volunteers aligned their movement to the beat. In practical terms, this finding suggests that music may be one of the best ways to affect the pace of your running or walking, especially if you are trying to maintain a pace with which you are not familiar or which feels awkward. Want to start jogging faster than you have in the past? 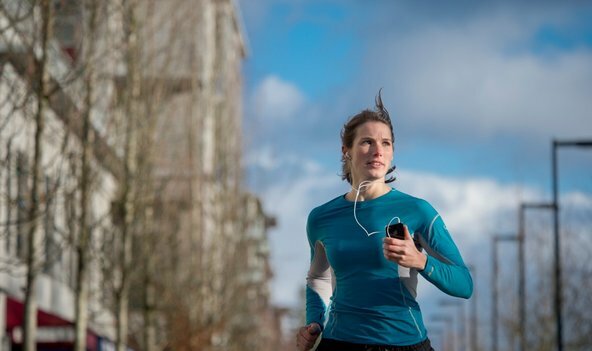 Load your iPod with uptempo music, Dr. Donelan suggests (although obviously ease into any changes in training slowly, to lessen the risk of injuries). Dr. Donelan and his colleagues even have recently launched an iPhone app called Cruise Control that allows people to coordinate their pacing with their playlists. Input your preferred running or walking speed and the app skims your music library (nonjudgmentally; if you like Nickelback, that’s your business) and strings together songs with the requisite beat, even subtly altering the tempo of songs, if needed. But of course, if you’re comfortable with your pace as it is, stick with it. For me, the most stirring message of these recent experiments is that, left to its own devices, your body will almost always obligingly try to choose the least demanding pace for you, a goal with which I’m happy to fall into step.